Click the button below to add the Roasted Garlic and Oregano to your wish list. Can’t go wrong with basil and roasted garlic in flavoured oil. The aroma is fantastic and makes even a simple omelette taste great. I have been a fan of Manitoulin Island products for some time now. I had originally tried them at a food show in Ottawa and was instantly sold on them. 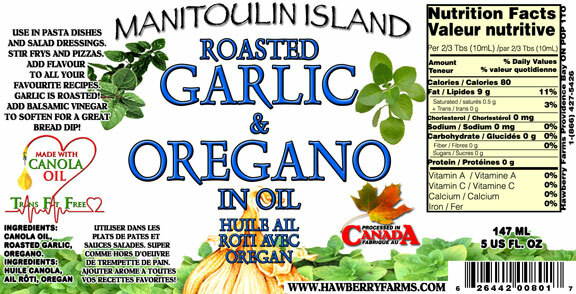 The oil products they have,such as the Roasted Garlic and Oregano are amazing. So much flavor without being overpowering. The oils blend with just about anything.